WD-40 is the new duct tape. If you’ve followed my blog for a while, you’ll know that for the most part, I prefer natural and homemade alternatives when I have the option. But there are rare occasions when I’ll stick to my guns on a particular product, and one of those products is WD-40. Why do I feel so strongly about a spray lubricant, you might ask? Because it’s just so darn useful, and it has saved my hide many times! One such experience happened about 20 years ago (yikes!) when my daughter Britta was little. She was going through a Silly Putty phase at the time, and carried it around everywhere. She must have fallen asleep with it in her hand one night, because when she woke up, I found her with a huge wad of Silly Putty stuck in her hair. And I mean STUCK! Britta had beautiful, long, blonde locks at the time, so I was particularly devastated thinking I would have to hack her hair up to get the putty out. Luckily, someone recommended trying WD-40 first, and I was desperate enough to try anything at that point! I soaked her putty-matted hair with WD-40, and to my great surprise, I was able to get every last piece of the Silly Putty OUT and Britta got to keep all of her hair! Spray WD-40 on tough limescale stains and mineral deposits in your toilet, and let it sit for a few minutes. Scrub with a toilet brush or a pumice stone, and the stains will dissolve easily! Parents, raise your hand if you’ve ever faced a crayon-on-the-wall incident. (If your hand isn’t up, lucky you!) Waxy crayon markings can seem impossible to remove, but WD-40 makes it easy. Just spray a bit of WD-40 onto the crayon markings and wait a minute or two. The lubricating action of the WD-40 will lift the wax from the paint, making it easy to wipe away with a cloth or a sponge. If you own any household tools or gardening tools, WD-40 is a must! A spritz of WD-40 will lube up the hinges and springs in your snippers and pliers, and a thin layer will help keep rust from forming on saws, trowels, rakes, and other metal surfaces. There are a hundred and one ways to remove sticker residue from things, and WD-40 is one of them! Remove as much of the sticker as you can, then coat the remaining sticker residue in a layer of WD-40. Wait a few minutes to allow the liquid to penetrate into the adhesive, then use a sponge to wipe away the residue. Easy! 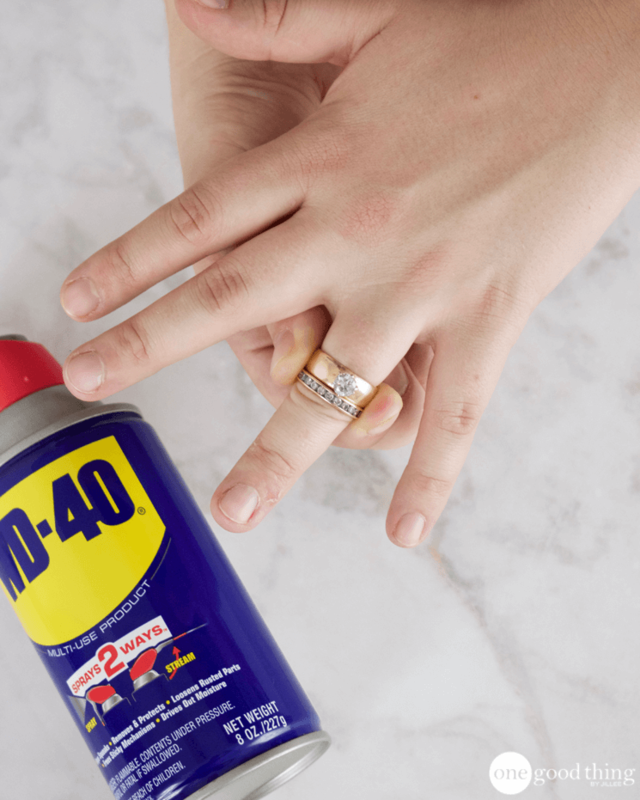 Use a spritz of WD-40 on your finger to help remove a stuck ring. Make sure to wash your hands afterwards! Clean stubborn tea and coffee stains on your countertops with the help of WD-40 and a little elbow grease. Use WD-40 on the blades of your scissors to keep them lubricated and working well. Spray the blades, then wipe them off with a clean, dry cloth. A thin layer of WD-40 on your car windows during the winter can keep snow and ice from sticking to them overnight. Spray a small amount on to the window, and spread it over the window with a clean, dry cloth. Stepped in gum? Save your soles with WD-40. Soak the gum with WD-40, then wait for a minute or two, and the gum will peel away from your shoes easily. Use WD-40 as a Rain-X type coating on your glass shower doors. All you need is a thin layer, and the water will bead right off. You’ll avoid water stains, which means less cleaning in the future. The same concept described above can be used to give your shoes a waterproof coating. Spray a bit of WD-40 onto a clean, dry cloth, and buff the outside of your shoes. This will also remove any salt stains you may have gotten during the winter! Use a small amount of WD-40 on a cloth to buff away scuff marks on your floors. Make sure to clean the area thoroughly afterwards to prevent anyone from slipping and hurting themselves! I love all your hints for using wd 40. I think I will get a fresh can this week. What removes wax from walls? Looking forward to many more uses for every day products already typically in most homes. This is the first newsletter I recv’d. I used it to spray a wasp nest and it worked without the dangerous lighter and spray can trick.